At risk of rehashing what is in this very short paper (open access pdf here), a few colleagues and I have a simple idea for how to encourage natural history in current ecology and evolution. A whole bunch of notable folks, including Harry Greene, Josh Tewksbury, Paul Dayton and more have noted the decline in traditional natural history – the taking of observations, collecting specimens, and classes in zoology and botany – among academics over the last half decade or so. Their papers all deserve a read as they point out very real problems and quantify these declines. Though these papers draw attention to the issue and make a very convincing case that it is an issue, they don’t offer realistic solutions. I’ll not overstate our case; our small idea won’t bring back botany classes where they once were taught or inspire people to create an insect collection at a college without one. However, we have an idea that may incentivize natural history study, at least a small bit. We propose that ecologists and evolutionary biologists create a natural history supplement with their paper to highlight potentially interesting observations and important natural history data. An example of character displacement? 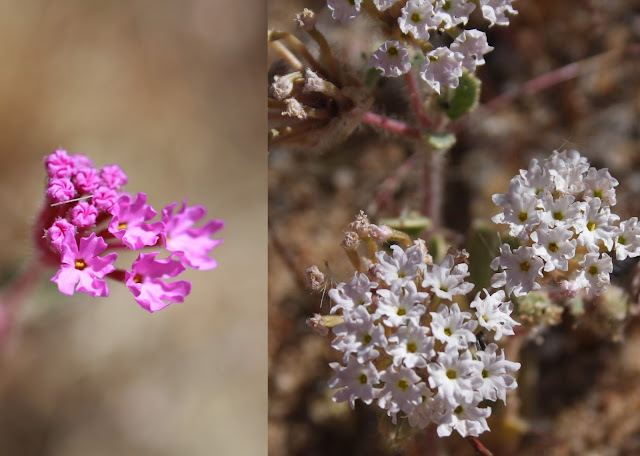 A somewhat disjunct population of Abronia pogonantha in the coast range (left) is deep pink-purple, where populations I’ve looked at in the Mojave which grow near Abronia villosa (a deep pink purple species) are whitish or very light pink (right). I’m not going to investigate it, but I’ll include it in a natural history supplement so someone else might and I took specimens of these plants and sent them to an herbarium. Anything of potential interest could go into this supplement (though it should not be used as support for the main assertions of a paper – any natural history of that sort still belongs IN the paper). This needn’t only apply to field studies, either – researchers working in greenhouses or in laboratories with colonies of microorganisms make important natural history observations, too – they are just as intimately familiar with their study systems as a field biologist. We think that there are a few reasons why this small addition would be particularly important and useful. First and most obviously, these observations WILL be useful to someone down the line, somewhere, sometime. Even if it takes 50 years for someone to investigate a particular plant or insect, these observations of behavior, population size, flowering time, etc. in 2016 are an invaluable snapshot of what you saw when. Richard Primack and co.’s wonderful reanalysis of flowering time data which Thoreau gathered in the 1800’s are a perfect example of this type of use. Secondly, meta-analyses and comparative studies are commonplace and particularly informative and could use those life history data included in these supplement that wouldn’t make it into a paper on another aspect, but are likely data that many folks take instinctively. Since we have the internet, archiving these sorts of things has never been easier. Many papers have a great deal of supplementary information (especially in short-form journals) and publishers have ways to archive it. While it doesn’t need to be done immediately, if this practice is adopted, a database of these natural history supplements could be compiled at any time. This caterpillar, Sympisits [Lepipolys] perscripta, is having a good year on both Antirrhinum vexillo-calyculatum (pictured) and A. cornutum. 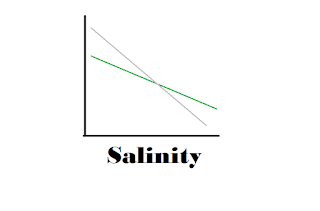 However, it is far more abundant on v-c. even when cornutum is the more abundant food. I’ll likely never write a paper on snapdragons, but if I did, this would be a perfect type of observation for the natural history supplement. Lastly, it incentivizes natural history observations and data. The “currency”, if you will, of academia is papers and citations. While including a natural history appendix doesn’t boost the first aspect, if the additional information in that supplement is of use to others, it can only boost your citation count and make your work more widely read. If those sound like good or bad arguments, read the full paper (again, here), there is a good bit more in it. I’ll conclude by saying that I’ve written two of these, both for papers in Ecology (here and here) and they have been easy and enjoyable to write. Has anyone actually read them? I’m not sure (do tell if you have!). Maybe not, but that doesn’t seem particularly troubling to me – even if one person reads them and gets inspiration for a study or uses some data in an analysis decades after I’m gone, I’ll be happy. Plus, they were more fun to write than the main text of these papers. I focused both of these by describing briefly a great deal of natural history, hoping that someone studying one of these systems (especially the well-known ones, like Mimulus or Petunia or Nicotiana) would think about insect- or sand-entrapment. On another level completely, I’m sure Ecology wouldn’t have let me use the fantastic quote “[Pholisma feels like] a squishy gummy bear covered in fuzzy sand covered hairs” in the main article 🙂 . 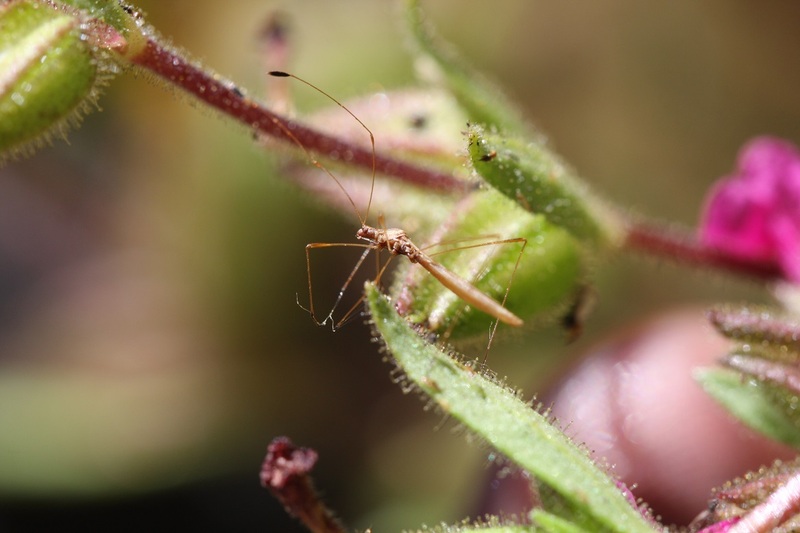 This stilt bug, Jalysus wickhami, moves easily on the sticky surfaces of many plants, including this weird, sticky fire-following monkeyflower, Mimulus bolanderi, by grabbing the glandular trichomes below their sticky heads. However, when I perturbed it for this photo, it got a bit of the sticky stuff on its front legs (visible in photo) and was visibly disoriented and had to groom it off with its other legs. 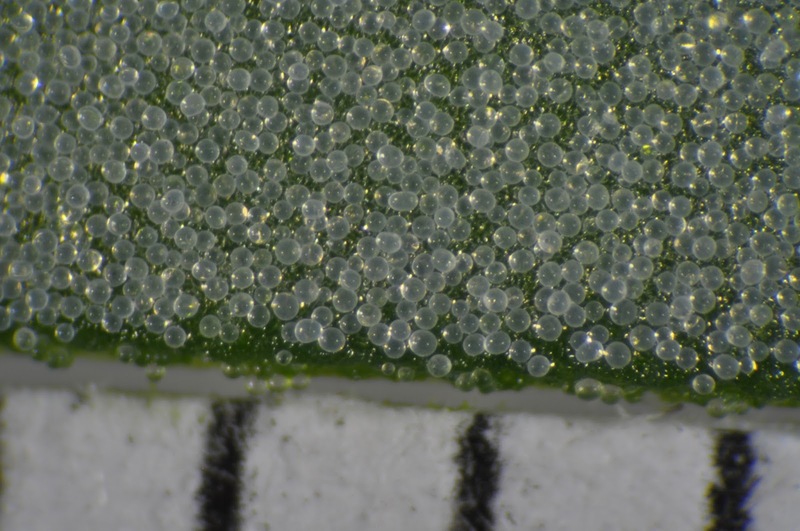 Some cool papers have focused on movement on sticky plants, so the trichome grabbing behavior is well-known, but I might still include this in a supplement (with proper citations to those papers, of course). Obviously, variation in traits is present in all populations and all species, but its quite easy to forget that – a mallard looks like a mallard, right? Evolution acts upon this variation, be it timing of flowering, anti-predator behavior or body size, constantly. I find variation in “characteristic” traits very interesting (and by “characteristic”, I mean how a naturalist would recognize a species, for instance in plants this might be color, growth form, leaf shape, etc.). I’ve been noting these for quite awhile and keeping a photo log – mostly of flower color, which is especially interesting to me – here’s a selection. I’ll mostly put a “normal” picture first and then the mutant. Here’s a normal Mimulus guttatus, the common yellow monkeyflower – a widespread, common and lovely species. McLaughlin Reserve, Lake County, CA. Normal Mimulus nudatus, a cool serpentine endemic in the northern coast range. Normal and white morphs of Mimulus layneae. Interestingly, the two white individuals in this population had flatter flowers as well. Why are white flowers so common in plants? Purple or reddish colors are caused by a group of chemicals called anthocyanins. These are synthesized in a pretty complex pathway that involves a bunch of steps, all mediated by proteins. If a mutation (or developmental issue), interrupts the function of any of these steps, you get a loss of function, which in this case becomes a white flower. In some species, there is simply a polymorphism – its not rare to have differently-colored flowers (or -colored seed, or -shaped fruit, etc.). This Leptosiphon sp. 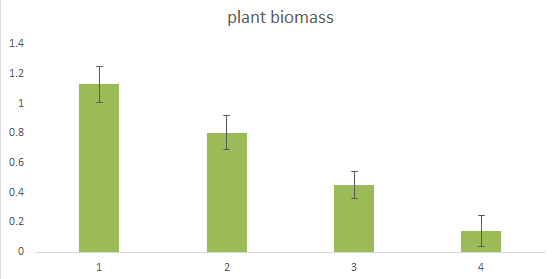 has both pink and white flowers in roughly equal proportions in a population I looked at. And another morph, of the same species! Sandy plants: a paper, an update, some wacky plant photos. Comments Off on Sandy plants: a paper, an update, some wacky plant photos. A little while back, I published a paper that Rick and I had been working on for awhile. In short, there are quite a number of plants which entrap substrate – sand, dirt, etc. 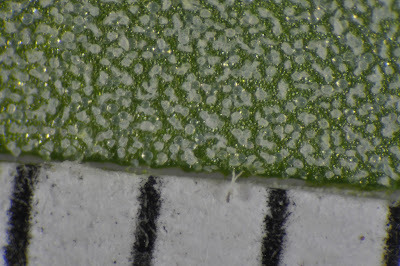 – on their surfaces with sticky trichomes. These species occur worldwide in dunes, beaches and deserts. Quite a number of people, dating back to the late 1800’s, had hypothesized that this “sand armor” must protect the plant, but nobody had actually gone out and tested it. So we tested both the hypothesis that it is physically defensive (who wants to chew on sand?) and that it is a form of camouflage (since of course, it makes the plant look like the background). Abronia pogonantha, one of the sandiest plants I’ve seen. Photo: EL. 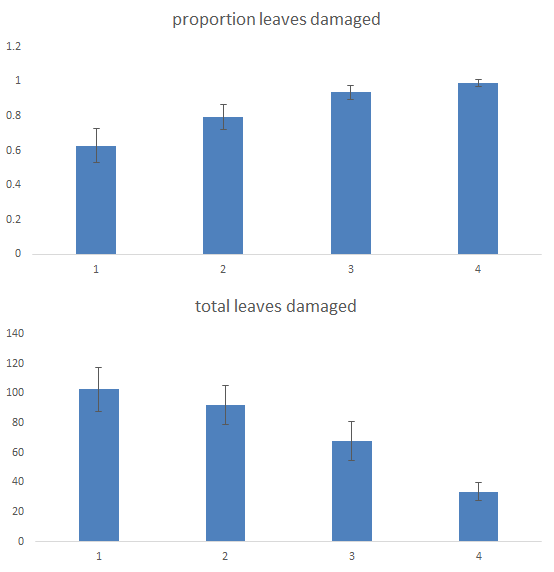 We found support for the physical defense hypothesis (in two tests) and did not find any evidence that the camouflage protects the plant. You can read (Inkfish – one of the best science blogs) or hear (Quirks and Quarks) more about this project. The best part of publishing this was hearing from a prominent researcher (who had noticed this phenomenon), that he tells his students: “if you don’t believe that sand is defensive for the plant – try sandpaper instead of toilet paper!” Since publishing this, I’ve been able to continue this research and observe quite a few more cool sandy plants – some of which were new to me and some of which I had only heard of. In that paper, there is a list of sand-entrapping plants. Many of these I had seen and noticed. Others were from published literature. I surveyed a bunch of really good naturalists and they suggested many others (their list was the longest). That is how I happened upon Pholisma, pictured above. This odd plant is a borage (the family includes some wellish-known plants including borage, heliotrope, fiddleneck, baby blue eyes, phacelia, etc.). Looking like a lump – maybe a mushroom? – it is completely chlorophyll-free, instead sucking nutrients from nearby plants (it is an obligate parasite, like Indian pipe, Monotropa, in the east). And the coolest part, of course, is how much sand it catches – it is nearly completely covered! It is very possible that plants which coat themselves in sand suffer a photosynthetic cost because less light reaches them. For Pholisma, that doesn’t matter at all! LOOK AT ALL THAT SAND! (I am pretty sure those purple things are flower buds – I didn’t unfortunately get to see a flowering individual). Pholisma was, since I learned about it last year, the top of my list of must-see plants and seeing it was one of my spring highlights so far. 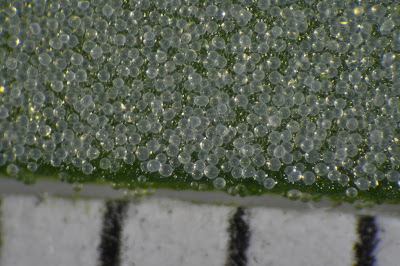 I happened upon it accidentally while looking at another sand-entrapping plant, Abronia umbellata (I used Abronia latifolia in my experiments). Abronia umbellata is not as sandy as some congeners, but it is pinker than most! (there is also a really, really, cool paper on floral evolution in this species – check it out). Photo: EL. The central coast of California has three species of Abronia which grow in close proximity on coastal dunes. Abronia maritima is generally on the beach while latifolia and umbellata are a little farther up (and occasionally grow over each other). 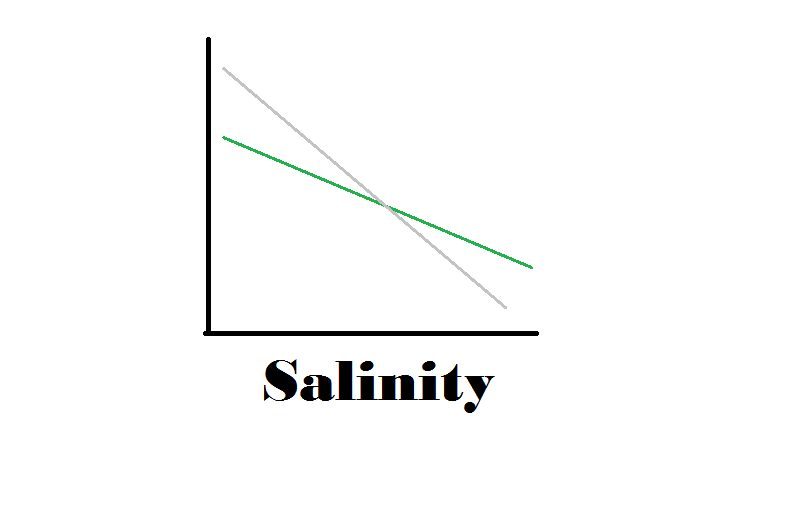 They each catch sand to some extent. Abronia maritima. 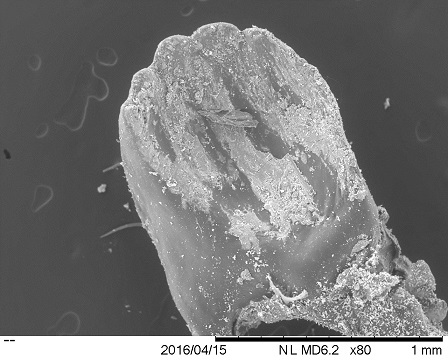 The yellow anthers are positioned right above the stigma and seem to drop pollen onto it (from my couple flower dissections). It has far smaller flowers than the other species. I’d bet quite a bit that it is selfing. Photo: EL. Abronia are awesome (everyone knows that already) but there are some smaller, more inconspicuous plants that are also really good at sand-catching. Tiquilia has nice flowers, but you have to look really hard to find them (they are tiny). This was a tall individual growing in a less-sandy spot (hence the lack of sand on the leaves and stems in the photo – the bottom still had lots). Photo: EL. Another new favorite plant was Centrostegia thurberi. A tiny, cherry red, spiny bizarre thing, it is mildly sticky and has bracts encircling its stems which catch lots of sand – seemingly with stickiness and also just being shaped like a bowl. This was another favorite. It also does this! 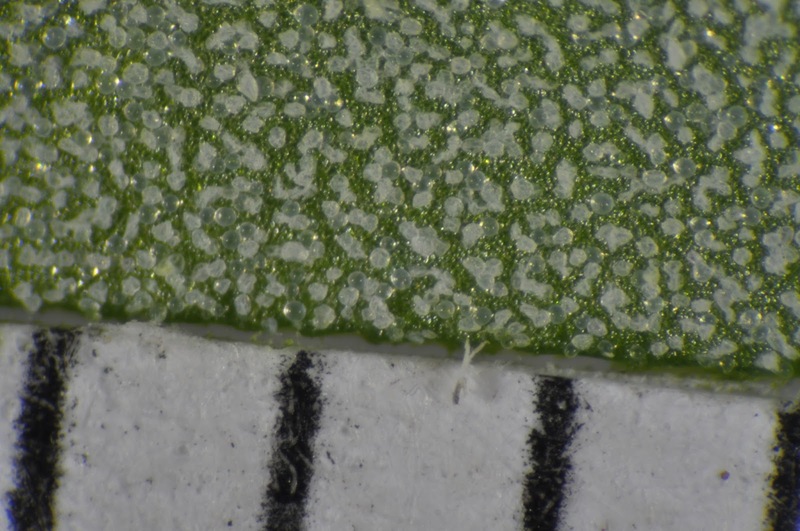 Dipsacus – teasel – often has these sorts of bracts that fill with water and mosquito larvae and stuff. I’ve never seen bracts full of sand before (and every plant had them!). Photo: EL. And lest I turn completely into a botanist, there were some insects, too. Importantly, there was one caterpillar – Hyles lineata – that was really common in a bunch of spots on Abronia. This species, the white-lined sphinx moth, is common over much of North America some years and absent others. Fortunately for me and unfortunately for many herbaceous plants, it is having a good year in southern California (especially near Anza Borrego). This Abronia villosa is not as happy as I am about this big (3″+) final-instar caterpillar. Photo: EL. While Hyles likes to eat Abronia (I’ve found them on pogonantha, latifolia, umbellata and villosa this year), they not like to eat sand at all. While it doesn’t have a good mechanism for taking it off, it seems to concentrate on nonsandy plants first and then on nonsandy parts of the plant, but it always ends up eating the sandy parts of the plant eventually. In the age of cell phones, accurate polling of the electorate has become difficult. In a world where a disproportionate percentage of people answering landlines for pollsters is white and over 50, we desperately need a new method of predicting elections. As the 2016 presidential election looms, a crack team of UC Davis innovators has a promising new source of information, woolly bear caterpillars (Platyprepia virginalis). 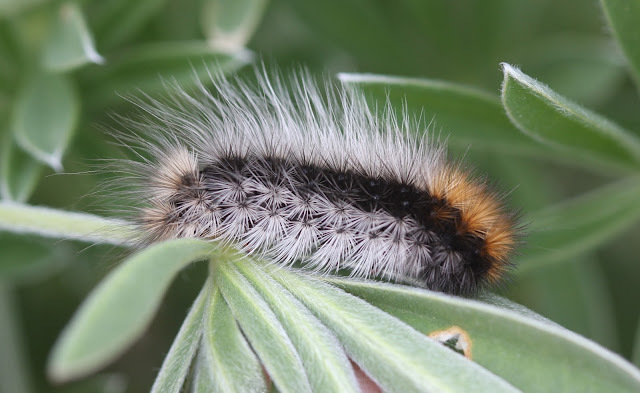 Rick Karban, a UC Davis professor of entomology, has tracked woolly bear caterpillar abundance since the early 1980’s at Bodega Bay, California. Each March, Karban censuses the same patches of lupine that he has for over 30 years. The study asks a vexing question: Why are there are so many caterpillars in some years and so few in others? Many insects, including pests cycle like this, therefore it is of keen interest to many. 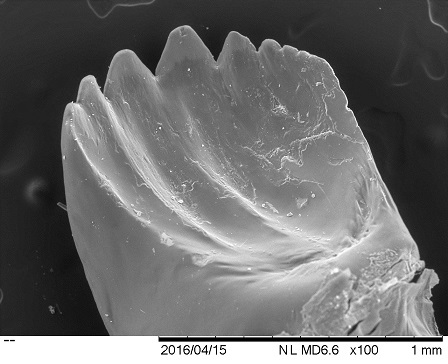 Dozens of papers later, Karban, his students, and his collaborators have answered a great many questions, including how caterpillars deal with parasites, whether population cycles are influenced by rain, whether caterpillars enjoy eating plant hairs, and how caterpillars avoid their predators. The population highs and lows seem random at a first pass, a jagged line moving up and down each year. The collected data, 1983-2015, full data available here. What separates high years from low years? 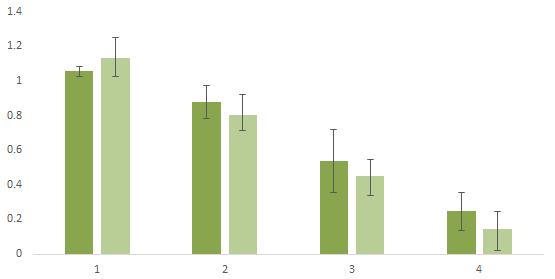 These motivated researchers have found a striking pattern in this data. 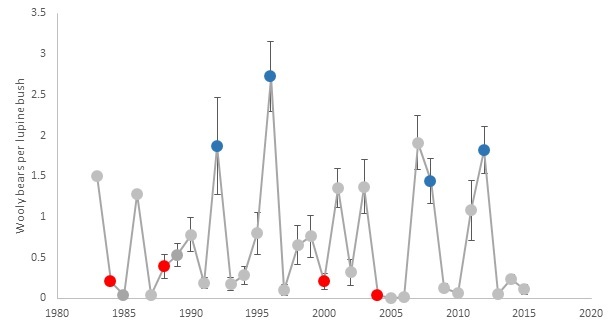 This data set includes eight presidential election years, with four Democrat and four Republican victories. Plotted with colors corresponding to the party association of the winner, the pattern becomes obvious. Red corresponds to Republican presidential victories and blue to Democrats. To reiterate: this is actual data! Woolly bears have years of high abundance when Democrats win and low when Republicans win. 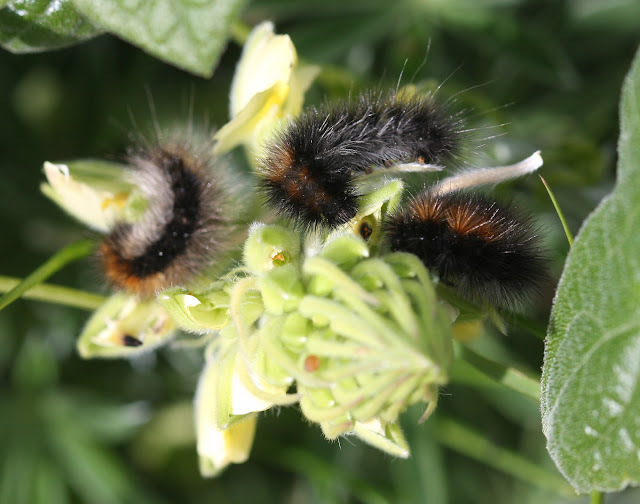 The average woolly bear abundance was 0.21 (+0.07 se) woolly bears per lupine in Republican years and 1.96 (+0.27 se) in Democratic years. This data shows that woolly bear abundance in March is a good predictor of presidential victories in the general election. It is tempting to assume that woolly bears are Democrats (and were particularly thrilled by second-term Bill Clinton), but we cannot exclude the possibility that their abundance is a protest gesture. Note that 2016 is not included on the preceding two graphs. For about a year, news sources have made predictions about the primary race and have even speculated about the general election. Given their wildly erroneous predictions thus far for both primaries, trusting their predictions for the general election seems ill-advised. The woolly bears, on the other hand, have a 100% accurate prediction record over the past 30 years. In years of low abundance, a Republican is elected, and in years of high abundance, a Democrat. Therefore, we are pleased to announce the woolly bears’ prediction. In mid-March of this year, Karban censused the woolly bears for their opinion on this volatile election year where no subject seems out of bounds and the populist wings of each party have come out like no election in recent memory. Even the woolly bears seem hesitant this year. Full data, including this year’s census (conducted in March). 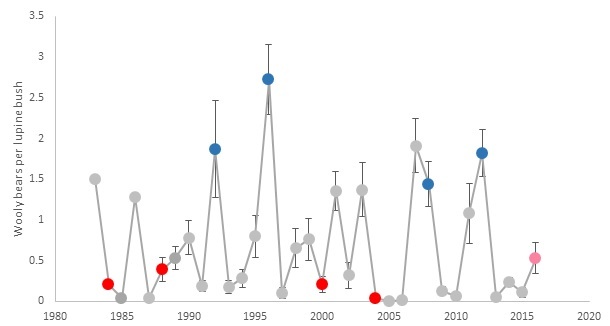 A superficial examination suggests that 2016 will be a Republican year – woolly bear abundance is not particularly high. However, looking a little closer, it may not be. 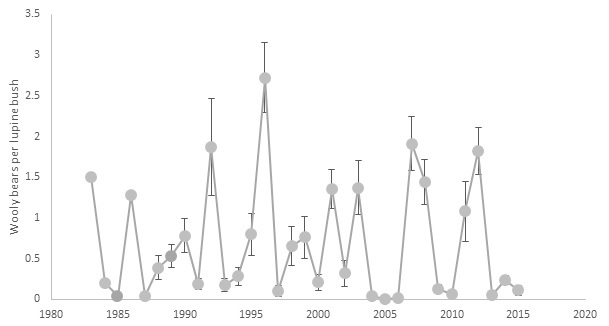 The number of woolly bears per lupine bush in 2016 (0.53) is higher than the average Republican year by 152% and is 36% above the highest Republican year ever recorded (1988). However, it is only 27% of an average Democratic year and still only 36% of the lowest Democratic year (2008). This result is without presidential precedent in the last 30 years. We suspect that the Republicans have the edge. However, a valid hypothesis would be a third-party winner, such as a right-leaning independent (a logical placeholder in between Democrats and Republicans). Perhaps Donald Trump will take particular interest in our data. Alternately, a contested Republican convention could produce a fractured party and the old Republican woolly bear average would not accurately represent the mean caterpillar abundances seen by this new party. The mainstream media have been shockingly inaccurate in their predictions so far, even despite complex and supposedly accurate statistical models. We need a new strategy to predict key events such as the 2016 presidential election. Rather than trust the opinion of a few people with a pulpit, the historically robust predictions of this population of caterpillars may serve as a better guide. This post was written by Eric LoPresti, Mikaela Huntzinger, Patrick Grof-Tisza, Ian Pearse, and, of course, Rick Karban (who we suspect is not fooling these infallible caterpillars with his Bernie Sanders impersonation). Rick Karban/Bernie Sanders. Who is who? Photo on left stolen from Berniesanders.com, right: Mikaela Huntzinger.